CB30 Photos, News, and Videos | Just Jared Jr. 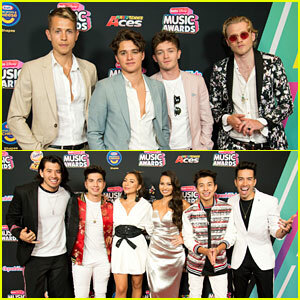 The Vamps are looking dapper at the 2018 Radio Disney Music Awards! The “Just My Type” singers – aka James McVey, Bradley Simpson, Connor Ball, and Tristan Evans – stepped out for the event held in Los Angeles on Friday (June 22). They were joined by their fellow musical artists JAGMAC, New Hope Club, and CB30. 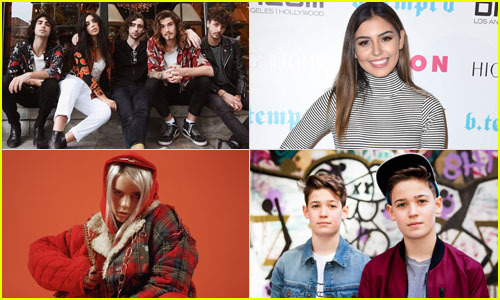 The 2018 Radio Disney Music Awards will take place TONIGHT, Friday, June 22nd from the Dolby Theater in Hollywood, and air the next day, Saturday, June 23rd on Disney Channel, Radio Disney, the Radio Disney app, and the DisneyNOW app. If you didn’t get a chance to watch CB30 perform at the 2018 Stagecoach Festival, JJJ is taking you behind-the-scenes! 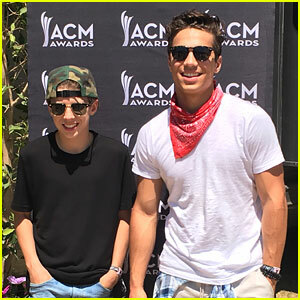 The Nashville-based country duo – featured in our “Musicians to Watch in 2018” and comprised of real-life brothers Christian and Brody Clementi – took the stage at the Empire Polo Club in Indio, Calif., alongside some of their favorite country stars, and they had a blast. Listen to “Like It’s a Bad Thing” below! Meet adorable brother singer-songwriter duo CB30! The country group, comprised of 15-year-old Christian and 12-year-old Brody, hail from Nashville and have been singing together since they were little! CB30 just released a music video for their super catchy song “Marina,” all about finally asking out your crush to hang out. The guys are even friends with country superstar Luke Bryan, who makes a cameo in their video at the one minute mark!